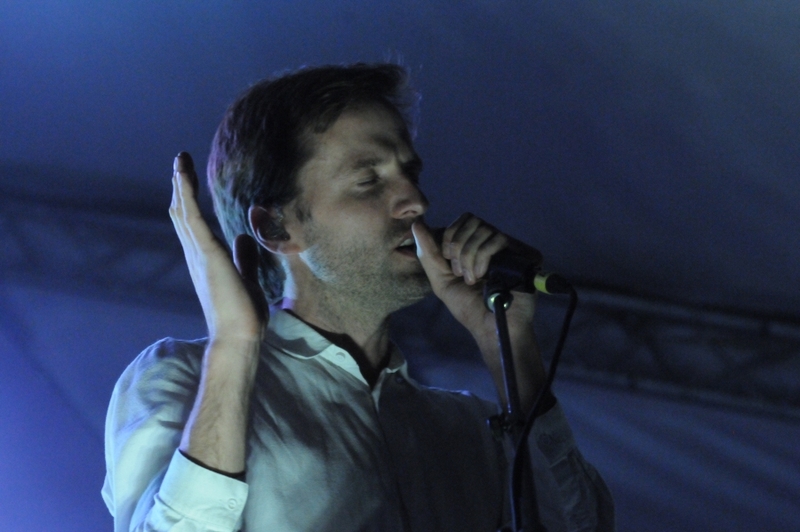 Cut Copy arrived in Austin once again, this time on tour for their latest album, Haiku From Zero. We sat down with Dan and Ben, backstage at Stubbs, to discuss influences, life on tour, local hotspots, and working at Blockbuster. Cut Copy would go on to put a memorable show that proved to be just as scintillating as it was epic. Lee: When you're in Austin, do you have any favorite spots or things to do while in town? Ben: We do, we've developed one kind of go-to thing in the last sort of couple of trips, it’s a taco truck, called Granny's Taco's, which is just sort of a couple blocks away, but they make amazing breakfast tacos. When you're on tour, getting something in your stomach after a big night is usually a Godsend, so finding this place that makes amazing breakfast tacos was a game-changer for us. We went there this morning. Lee: Haiku from Zero was recorded remotely, which this is the first time you've done that, correct? Dan: Well it was written remotely, and then, we did a bunch of recordings, remotely, but then, inevitably we kind of had to meet up to finish the recordings, so we did a bunch, maybe 4 or 5 weeks in Atlanta, just kind of doing the final stage, but yeah. As far as everything else up to that point we've done separately. Ben: We worked with a guy called Ben Allen, who we'd mix the albums with back in 2010, and yeah there's a studio there. We wanted to work with him more, so we hadn't really worked in that sort of classic, Ben in the studio with a producer at the helm, kind of model for a while, so we wanted to do that. So we rented a Airbnb, lived there for like a month, or more, maybe 6 weeks. And, yeah it was good. It's a good city to do a record, a lot of new stuff, really great places to eat and drink, and yeah obviously Ben, we love Ben. He had a really great studio there as well. Lee: So no collaborations with Outkast, or any Atlanta artists coming up? Ben: Not this time around. Lee: I know you guys are NBA fans, did you catch Hawks games while you were there? Dan: We went to one actually. Dan: Which was really cool. Ben: Yeah. Our bandmate is a big Boston Celtics fan, but Ben Allen is a pretty big Atlanta Hawks fan, and we saw the Hawks. Dan: Hawks versus the Bulls actually, pretty cool. Lee: Do you have to be a Ben Simmons fan? Being from Australia right now he's kind of like the new Jesus from Down Under. Dan: ...yeah a few months ago. Ben: ...and he was playing, which was, yeah. That was pretty cool, but I think if anyone in Australia kind of doesn't even vaguely have interest, in a foreign sport, the press just goes obsesses over them, and it's just sort of, so we're probably, you know, overloaded on Ben Simmons already, without him even, yeah he's had one season or something now, but I feel like I've read a lifetime of articles about him just from Australian magazines and newspapers and stuff. Lee: Gotcha. One thing I'm curious about before Cut Copy kind of took off, how did you guys make a living? Did you have any odd jobs going on? Dan: I lived in the area where this video store was, and he'd be the guy going in, you know, gets the DVDs or whatever, and he'd be there at the counter. That was sort of funny like, going in for a video, and going "how you looking for rehearsal next week?" Lee: Was it a Blockbuster? Ben: Which it's kind of amazing, because they're all gone now. I remember when I started working the place was still VHS videos, but mainly VHS. Then it was mainly DVDs, then couple Blu-Rays, and it was...I mean I finished it before it failed. They didn't last much longer after I left. I must have been holding it all together. Lee: You saw it all the way through then? Lee: As Cut Copy was starting, what were your biggest influences? Ben: I mean I guess probably a lot of the influences are in the album sleeve, you know a lot of the artwork I did for that was referencing the artists that were inspirations, but I mean I guess just from a perspective, like an Australian guy, like The Avalanches were hugely influential, because they were probably the first act that I knew of like electronic, sort of, band to emerge from Australia and really have international success. Ben: Yeah, I mean there just weren't many artists that came out of Australia at that point in time, I guess it was a lot harder, the internet wasn't sort of a medium for getting your music out at that stage. So you need to kind of somehow, get a record deal or get on the radio if you want to even play a show outside of Australia, so The Avalanches were pretty influential in that, certainly at that point in time. Well you know, if they can do it, then maybe we can do it, kind of thing. Lee: What would a perfect day for you guys look like? Ben: I don't know, any day that would be perfect would be, you know, once you have it, you'd be looking for something else, but I don't know, it depends. I think the perfect day for me would probably just be at home, but you know, I'd get bored of that as well and want to go on tour again. Dan: Yeah, the life a musician is kind of a strange one, because you're never really 100% settled, 'cause if you're writing a record you're at home all the time, you don't really see anyone, you're kind of just in a bubble, and then when you're on tour, you're kind of in front of people the whole time, like you're never in same place for more than a night, and so somewhere in the middle of those two things, is kind of an ideal life, but you never have that ideal life. It's always one extreme or the other, and that's just kind of the way it ... that's the life between both those extremes. Lee: I know when you guys write songs it's first you create, but then you go back and make sure you can play it live, is there a catalog of music that just sitting somewhere, that you could release later? Ben: I mean, not really, there's definitely a catalog of songs that never made onto our records or anything like that. Probably a long catalog, but I guess, you know, there's probably like, you know just wanting what we put out there to be as awesome as it can be, so we kinda don't want something that's two thirds good, we want it to be 100 % good. Ben: I don't know if we're ever going to release those. Dan: Thanks for reminding us. Lee: Has touring taken over your life recently? Ben: It's great fun, I think we're ... we've been doing it for a while, and sort of, as the years go by, it doesn't necessarily get easier it just sort of back up day after day, doing what we do, but we still have to remind ourselves how lucky we are to be doing it and playing amazing shows, at places like this, and going to really nice cities, it's a pretty rad job. Dan: I think it does in a way, I think the only thing with touring is you kind of, even when you come off tour, you feel there's a bit of a recovery period. It's like you kind of, yeah it's like a surreal existence, you know when you're off on tour. You're getting a lot of attention, and you're probably exhausted most of the time, even though, but you're constantly stimulated. Dan: Then coming home, it's like there's a come down from that, you just, it might take a week or two to sort of get back down to Earth, and be like "okay, alright, I'm back in the real world again". So, I think, yeah, even sometimes when your home, you're not really 100% home, a part of you is still out on tour in your mind. But yeah I don't know, I kind of enjoy the feeling of adventure and unexpectedness of touring, cause it just feels like you're never quite sure what the next day is gonna bring, it's like, you know, it's exciting. Lee: At least you know Granny's Tacos is happening in Austin.